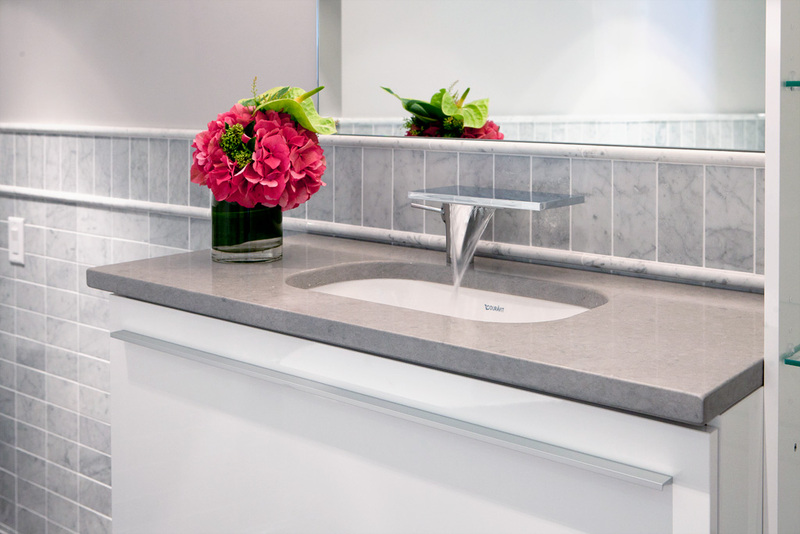 View this stunning Vancouver bathroom interior design project. This stunning Beach avenue apartment in Vancouver BC was a truly amazing interior design project. The bathroom redesign was one of the most complex and fascinating interior design challenges I’ve faced to date. I’m pretty sure these clients now have the best bathroom in Vancouver. 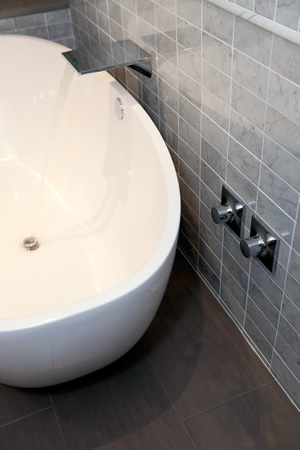 The entire design was centered around the installation of a state-of-the-art shower and bath. 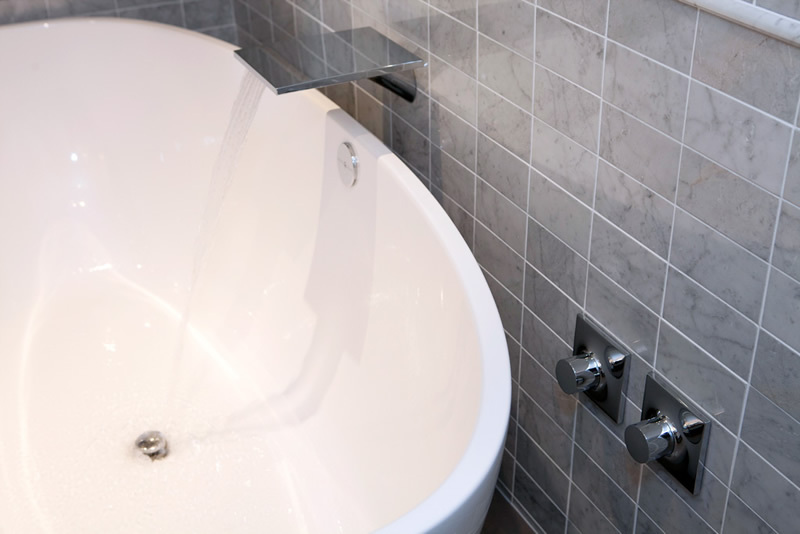 The plumbing for both is digitally controlled by a thermostatic pressure valve that ensures water temperature is always exactly perfect — even on the first drop. 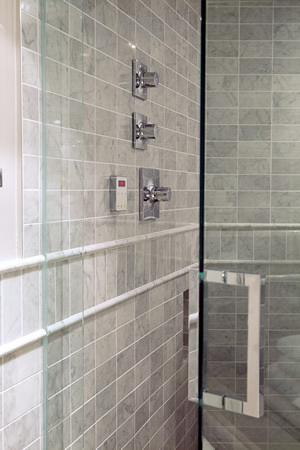 The shower has multiple functions, including a rain shower, steam shower, and a handheld control system. All of this requires a discreet generator, which is hidden in the shower bench. Not only did I arrange the installation of this amazing system, I also drafted the entire room layout and suggested all the decor elements, ranging from the absolutely luxurious volcanic limestone tub all the way to a shampoo shelf inset in the shower wall. 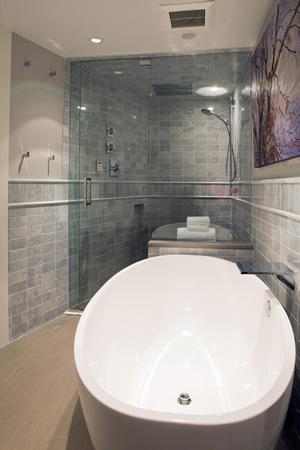 The bench was designed to accommodate both clients, so they could sit together and enjoy a relaxing steam. All of this had to be done in one of the most unconventionally shaped rooms I’ve ever seen. Not one of these corners is 90 degrees, though this Beach Avenue apartment turned out incredibly well. As any good interior designer should know, happy project = happy clients.